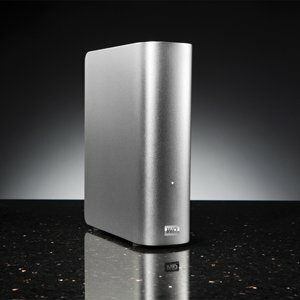 Western Digital reveals new My Book Studio external HDDs with a brushed aluminium casing. They are available in capacities from 1TB to 3TB, but unfortunately there's no USB 3.0 support. Western Digital® (NYSE: WDC) today announced that its newest generation of the popular My Book® Studio™ external hard drives are designed for use with Mac® computers and Apple Time Machine. Now available with a 3 TB storage capacity, the new design features a brushed aluminum casing to match the appearance of a Mac computer, and also serves to keep the drive cool while in use. The aluminum exterior, combined with its WD® Caviar® Green™ drives, eliminates the need for an internal fan to reduce drive noise and extend the life of the drive. Although formatted for Mac computers, the My Book Studio external hard drives can also be reformatted for PCs. The My Book Studio external hard drive includes all the features and benefits that have made it one of the favorites among creative professionals and Mac computer enthusiasts, including its fast and flexible FireWire™ 800/400 and USB 2.0 interfaces, user-controlled automatic backup software and drive management, password protection and hardware encryption. Shipping in capacities of 1 TB, 2 TB and 3 TB, the My Book Studio drive includes the WD Caviar Green series of internal hard drives with WD GreenPower Technology™. WD's My Book Studio is available on the WD store at http://www.wdstore.com/ and at select retailers and distributors. MSRP for My Book Studio with 1 TB is $149.99 USD; MSRP for My Book Studio with 2 TB is $199.99 USD; MSRP for My Book Studio with 3 TB is $249.99 USD.